When it is a Modified Hall of course! Hawksworth’s Great Western Railway Modified Hall at first glance is similar to Collett’s Hall, but interestingly in some respects it was rather radical and broke the railway’s usual practice of design for two cylinder locomotives. It used plate frames throughout, which was very different to the approach that of both Churchward or Collett. Visually the difference between the two types of hall is subtle, but there are differences in the cylinders, fames, superheater and firebox saddle. However, it is the plate frame stretcher, a feature that only the modified hall had that is the most obvious visual difference. 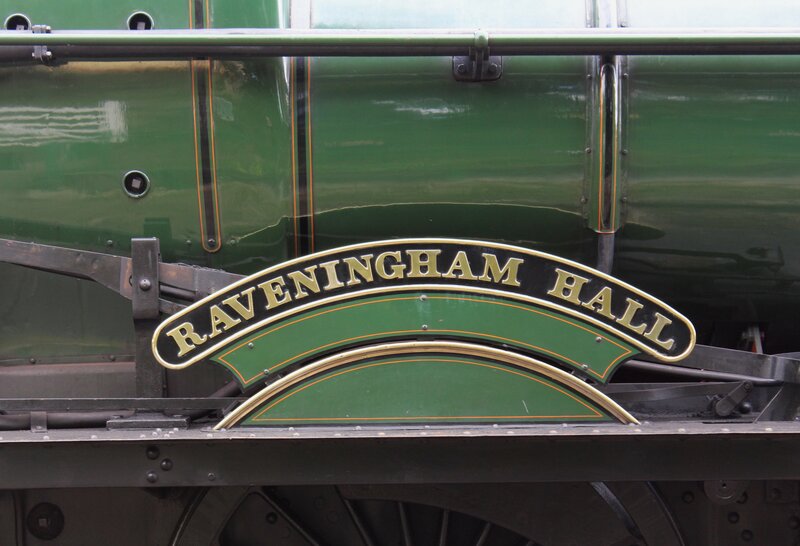 Compare the picture above of Hawksworth’s modified Hall 6960 Raveningham Hall with Collett’s 4936 Kinlet Hall below. You will notice that the plate stretcher (looking above the front bogey,) that can be seen on 6960 is absent on 4936. 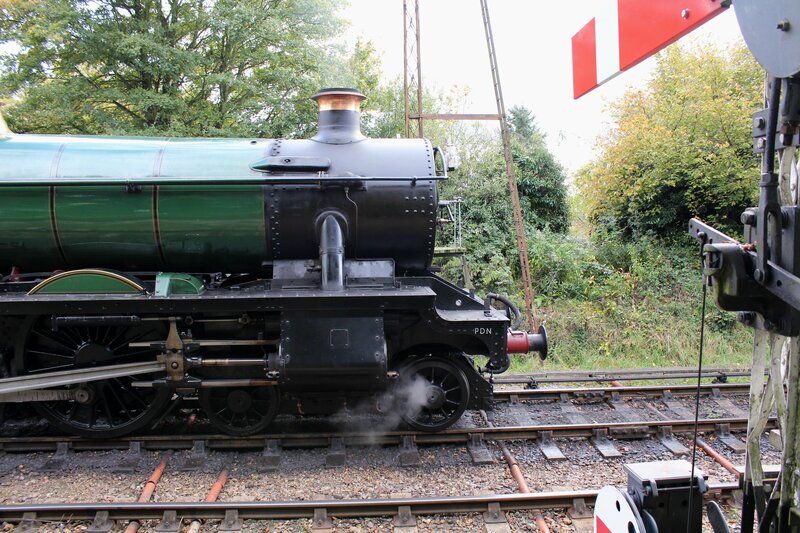 It also means the hall’s short overhang under the front of the smokebox is blocked from view by the plate stretchers on the modified type when viewed at this angle. 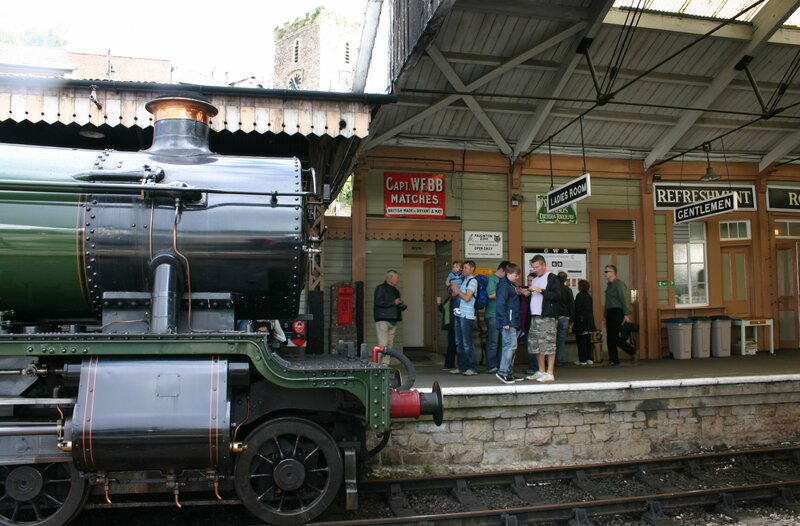 So with that little piece of GWR trivia cleared up, let’s continue! 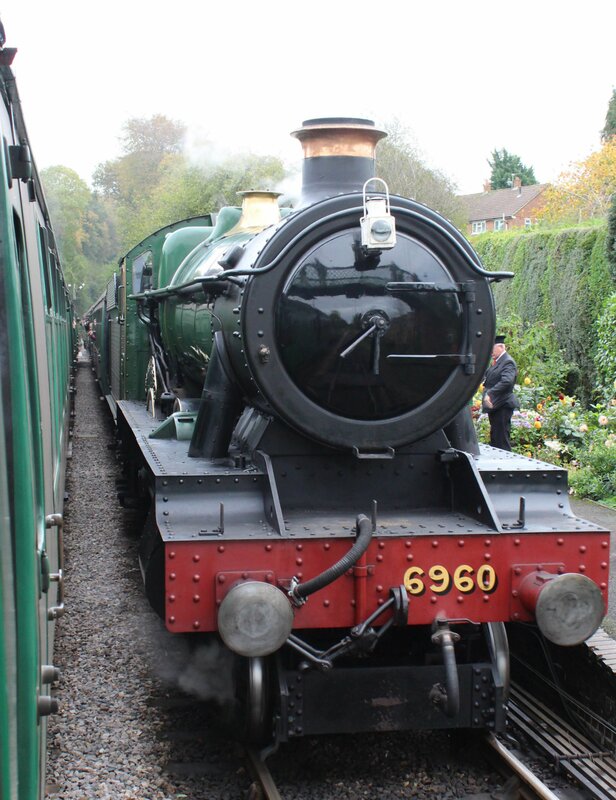 6960 was one of four visiting locomotives at the Watercress Line’s Autumn Spring Steam Gala 2014. Built in 1944, it was actually the second of its’ class produced. 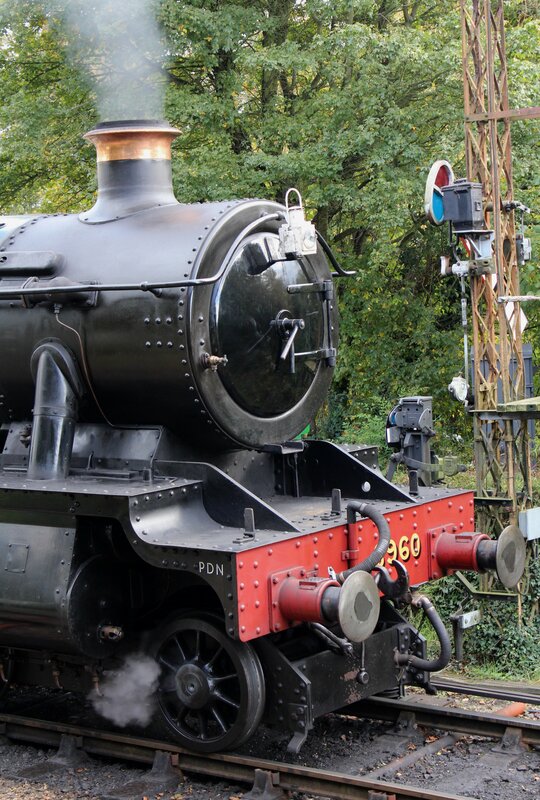 As with so many locomotives, we have Barry scrapyard in South Wales to thank for its survival, as after withdrawal in 1963 it was sent there to await being saved nine years later. There is something very graceful about both types of Hall class, their design just seems to make sense visually. 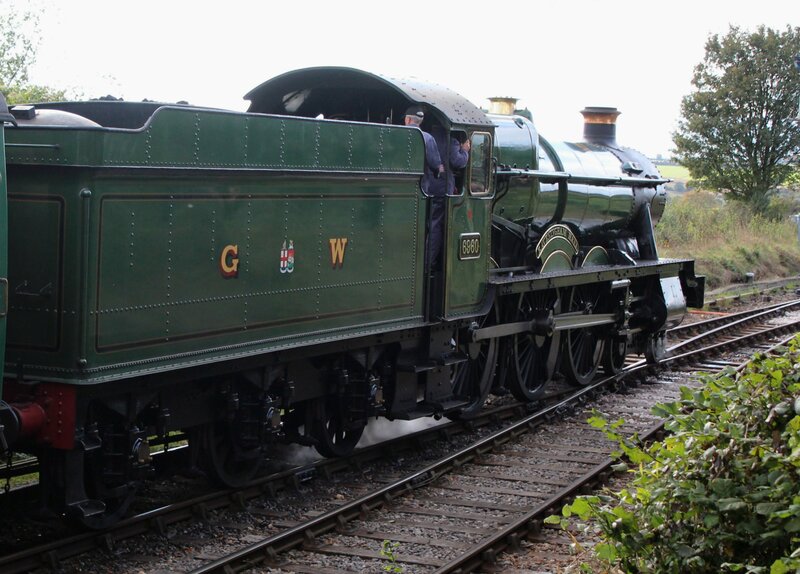 This is something that can be said about many GWR designs, especially (as we shall see in due course) the Castle class. 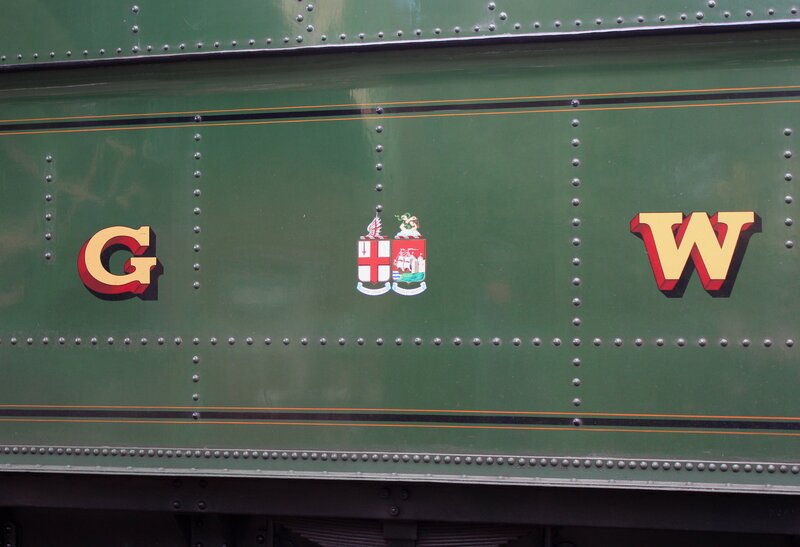 During the gala, Simon and I found this particular locomotive to be somewhat elusive for our cameras. 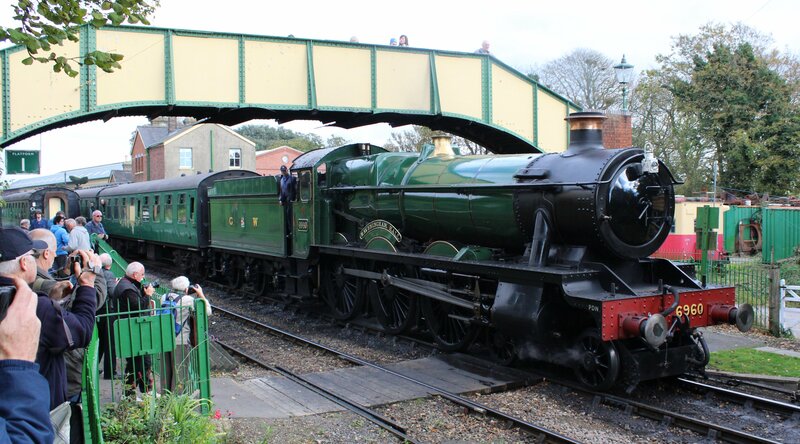 We got a brief look as we passed it on another train in the picture on the top of this blog post and I had to try something a little different in the picture below! Fortunately we did get a good look at her in the end, long enough to get a few other pictures. Funnily enough, I’m rather pleased with the picture above. Sometimes us rail enthusiasts put so much effort into excluding people from the shot that we are not perhaps as open to trying something new. 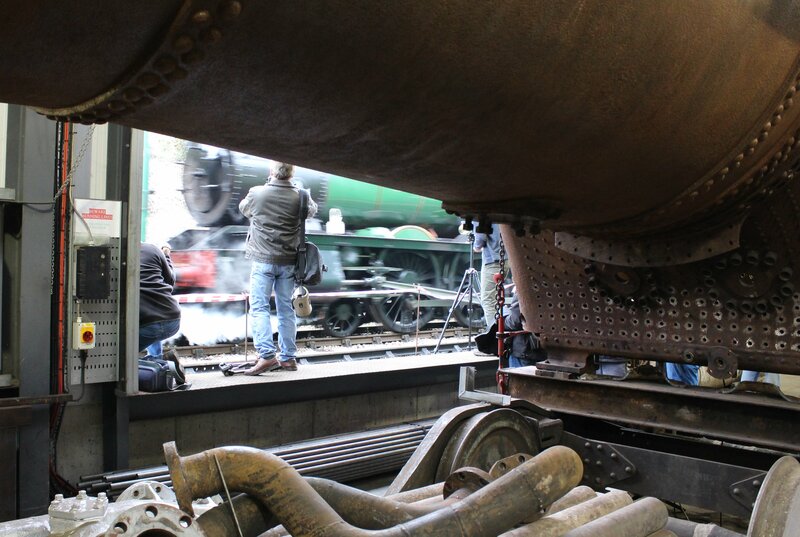 Equally, the picture above, although not as dramatic or particularly amazing looks better (in my opinion at least) because it shows the numbers of people with cameras focused on this steam engine. It shows that I’m not the only one who likes the look of this class! Finally I’ll leave you with one more view of those plate frame stretchers (below), just to remind you of when a hall is not a hall! Thanks for reading!